The Pass-Band Tuning Board is a multi-function board which generates the master oscillator frequency, mixer injection signals and secondary signals through a frequency divider network. In addition the board does the "Mode" function switching and controls the manual pass-band tuning adjustment. 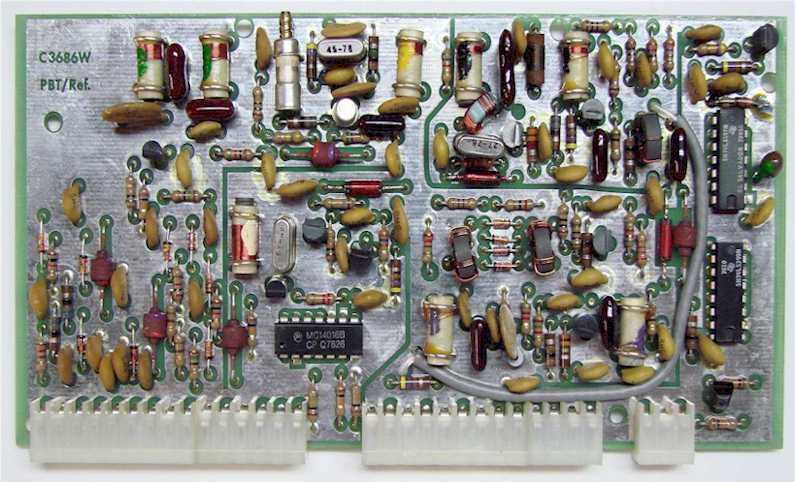 Of the many functions, this board generates the 40Mhz master oscillator signal of which most every part and function of the radio is connected to. 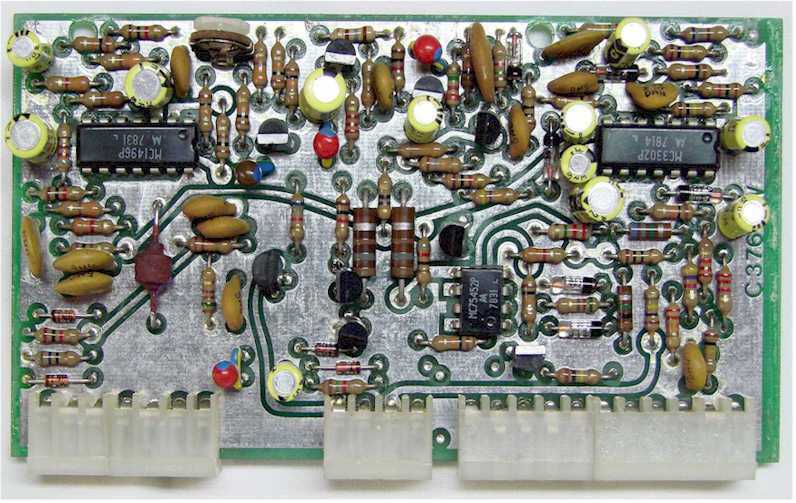 This 40Mhz high stability crystal oscillator signal source is considered the heart beat of the radio, problems here affects all other parts and functions of the radio in some way. One output of this signal is sent to the frequency divider network which outputs the 500Khz signal for the synthesizer lock reference and a 25Khz signal used for the receiver "25Khz Calibrator" function. This boards also feeds the mixer circuits to produce the 53.696Mhz injection signal to the 2nd Mixer Board and the 5.645Mhz BFO signal to the Transmit Exciter Board. For the Pass-band Tuning function this board contains a 13.696Mhz VCXO, or Voltage Controlled Crystal Oscillator, which is capable of pulling the crystal oscillator frequency +/- 3Khz depending in the bias voltage applied. Preset bias voltages for each Mode of Operation of the radio is switched through a quad IC switch which is controlled by the front panel "Mode" switch. These voltages are preset with individual "Mode" adjustment controls located on the Power Supply Board. These preset voltages set the VCXO to the exact offset frequency for the "Mode" selected from the front panel. When the Pass-Band Tuning is set to the manual tuning mode, the front panel "Pass-Band" control varies this bias voltage controlling the VCXO frequency. This allows the receiver to be manually adjusted from the low side of the crystal filter (LSB) through the high side (USB) of the crystal filter pass-band range. The IF/Audio Board supports multiple functions in receive and transmit modes. In the receive mode the board takes the 5.645Mhz IF signal from the Filter Board, provides additional gain and AGC control and produces a signal level voltage for the S-Meter functions. The function of the AGC (Automatic Gain Control) is to provide a constant level signal to the detector stage with varying input signal level to the receiver. The resulting output of the detector stage is demodulated receiver audio which is then sent to the audio amplifier and speaker. In the transmit mode the board uses a crystal oscillator to generated the 5.645Mhz transmit IF carrier signal. 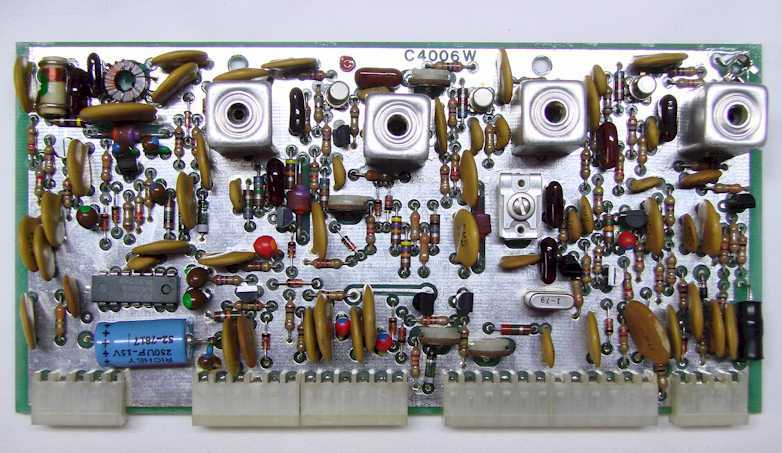 In the AM and CW modes this signal is sent directly to the Filter Board, and in the SSB and RTTY modes the signal also includes the mode frequency off-set before going to the Filter Board. The Transmit Exciter Board provides microphone audio amplification, controls the transmitter VOX functions, produces the modulated transmit IF frequency, and provides the +10 volt transmit/receive switching. Microphone audio from the front panel connector is sent to this board where the audio is amplified and sent to the balanced modulator input and the VOX circuits. The VOX circuit is controlled through the setting of three front panel controls, VOX Gain, VOX Delay and Anti-VOX. With these adjustment the VOX circuit is adjusted to key the transmitter with signal input from the microphone, controls the transmit delay, and prevents the receiver audio from keying the transmitter. The amplifier microphone audio feeds the balance modulator and mixed with the 5.645Mhz transmit IF carrier signal from the IF/Audio board to produce a modulated transmit IF signal. The output of the balanced modulator is then sent back to the Filter Board and through the 2.3Khz SSB filter to limit the signal bandwidth of the transmit signal.